Wouldn’t it be great to be able to compare how much chicken is at Safeway, Lucky, or Whole Foods? Now you can with AnyLeaf. I was excited to meet with the trio of founders (Jeff, Josh, and Jason) from AnyLeaf as they are a local start-up. Being only 20 miles away from me, they drove to my neck of the woods so we could talk about their new venture. The concept is simple but only possible with their programming background. Say you need to get a few items from the store but don’t know which one is currently offering the best prices. Not only can you now compare prices, you can also see how good of a deal it is in relation to previous weeks. Just type in your zip code and a list of all the deals from the stores near you will come up. As you can see on the following screenshot, Safeway is having Tropicana Pure Premium at the lowest price it’s been in weeks. That means it would be a good time to stock up until the next time this deal rolls around. But to really appreciate the functionality and value of this site, it really helps to know the background of how it came to be. The creators of AnyLeaf enjoy cooking. Sometimes the just need to get one ingredient but both Safeway and Lucky are the same distance away. Which should they go to? Which one has a better price on the needed ingredient? Jeff, Josh, and Jason felt that AnyLeaf was the answer to fill a market that hadn’t yet been tapped. Some bloggers will post match-ups of current weekly deals at various stores. But those are spread throughout the blogosphere and users need a bit of computer savvy and time to find those. AnyLeaf could be the go-to place in comparison shopping for consumers, specifically mothers. There are a couple other features available for those that sign up for a free account. You can create an online shopping list to save the trouble of writing one on a Post-It before each shopping trip. There is also the option of marking certain items as favorites and bring able to easily access them. Believe me, there are plenty of deals that you will probably want to share and there’s a link to do that as well. So what does the name AnyLeaf have to do with grocery shopping? Their answer? They look for grocery deals under ANY LEAF. While the functionality is there and I definitely think it will come in handy, it really needs a facelift. AnyLeaf is constantly growing and new features are added all the time. Soon you will also be able to search drug stores such as Rite-Aid, Walgreens, and CVS. 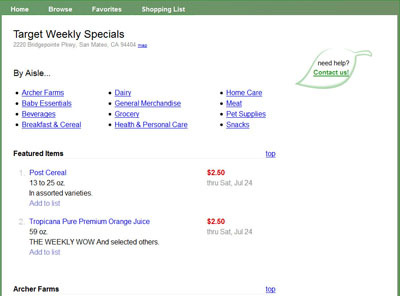 Other grocery store such as Trader Joe’s are in the works but it all depends on how they list their specials and the programming of AnyLeaf. I think this is a great site and will help a lot of people save money, including me. So check it out! One reader will win a $25 Safeway gift card. Visit AnyLeaf and tell me what feature you like best or would like added. “Like” AnyLeaf on Facebook and tell them Cookies & Clogs sent you! Disclosure: I was provided with a Safeway Gift Card from AnyLeaf.com to test the site and run a giveaway. The review presented here is 100% my honest opinion. I really like the shopping list feature! I like that it compares the 2 stores that I frequent the most and add items to a shopping list. This really does have potential. 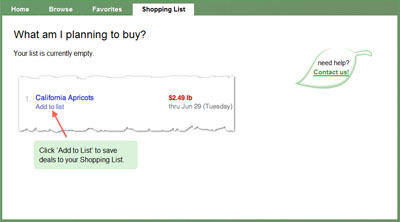 advertisements that are mailed out weekly AnyLeaf would streamline the comparison-shopping process. I like best browsing by category, that’s convenient! I subscribed by email #2. I like shopping list, it helps me get organized while browsing. “Like” AnyLeaf on Facebook@tcarolinep JessieKatie S and commented. Watching for the sales is the most important feature to me. it would nice if they could add qfc, looking forward to their Rite-Aid addition. i follow anyleaf on twitter. You can make your own grocery list from every department and know that it’s the best buy! I liked the way you could favorite stuff to use later. I like that you can browse aisle by aisle (which is the easiest way I find to write a grocery list) and write your list according to what is on sale in each aisle. I wish they had prices for my area in southern Ca! I really like the “Shopping List” feature. I like the online shopping list feature! I liked AnyLeaf on FB and told them that you sent me! I like Shopping List feature. I love that you can have your own Shopping List! Thanks for the chance! I’m an AnyLeaf twitter follower (@whitechocolatec). i like their best deals of the week feature! I like the price comparison tool! Wow! I would love this if it were in the Chicago area! I am always trying to figure out the best price of meat and produce etc. But rarely see it mentioned on the deal blogs. I follow anyLeaf on Twitter! I would like to see them show stores in my area. I “Like” Anyleaf on Facebook and told them you sent me. I like that you can search by your area. I really like the shopping list. I’m following you on Twitter (kristisdeals1). I’m following AnyLeaf on Twitter. I really need the shopping list. I come home with way too much junk. I like that it lets you search by store or category, and when under browse, lets you search by aisle too! I also enjoy seeing the best deals for all the stores in one quick overview. I love that you can browse by aisle! My fave feature is that I can choose to search by category and then see where meat is the cheapest each week! GREAT feature! Like AnyLeaf on FB and told them you sent me! Your button is on my blogroll in the right sidebar of my site! I like the map feature to see if a store is on your intended route or how far off it really is. First time I have visited you and AnyLeaf. I like both sites. I like that AnyLeaf not only list the store at the top of the list but also at each item. For forgetful minds like mine it’s nice not to have to scroll around to see the store. As for your site – love it! 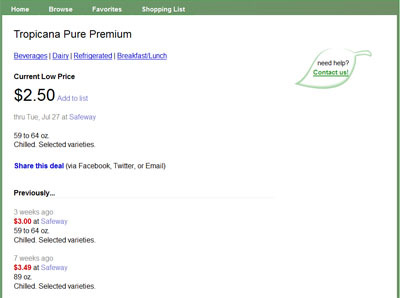 AnyLeaf will be better when it has more stores added and a more sophisticated interface. Thanks for the feedback. What stores would you like to see added? The feature I like best is that you can search a great variety of grocery stores and (soon) drug stores too – for the best prices! What a time-saver that is! I like that they are showing at least one store in my area, however Safeway isn’t showing up. What’s the address of your local Safeway? I’ll look into why it’s not showing up. Thanks for checking out our site! I love that all the prices are compared but its not in my area yet. They will let me know when they are!! I like that you can make a your own shopping list of bargains. I like that I can search all the drugstores! I love the price comparison feature among the stores. San Francisco is so lucky to have you, AnyLeaf! I’m waiting patiently for them to come to Washington State. I like the Favorite feature best! I “Like” Cookies & Clogs on Facebook. really like that you can compare prices! Ha that’s easy, wish ANYLeaf covered fort worth! I like it that you can compare prices! Like for them to come to my area…it says not available yet. Like that you can compare prices before you go to the store, thanks. compare prices of differant stores ty. Love the concept – they just need to do it in Denver. Thanks for the contest. Thanks for the giveaway…the feature I like best about AnyLeaf is that it finds the best price in a specific geographic area among multiple retail outlets of varying categories.